THE crush is suffocating. All five of my senses are being bombarded, from the overpowering stench of my fellow commuter’s breath barely inches away (chicken balti was on the menu last night, I deduce) to the tannoy announcements, played on a torturous endless loop, urging us repeatedly to ‘report unsuspected packages’ and ‘mind the gap’ Even the lighting seems like a visual assault. Suddenly there’s a sharp jab in my ribs: ‘Oi, mate,’ a man beside me says. ‘You’re invading my personal space.’ Personal space? If only there was such a luxury. I feel I am on more intimate terms with this man than I am with my own wife. I can smell we share the same brand of shaving gel. His hair, still shower damp, is brushing against my cheek with every jolt and lurch of the carriage. Welcome to the hell on wheels that is the 47-minute commute aboard Britain’s offically most overcrowded morning rush hour train – the 07.32 Woking to Waterloo. Last month week this South West Trains service was named in a list of shame of the Top Ten overcrowded train services in Britain. According to the official Department for Transport figures, it’s overloaded by 154 per cent, meaning there are 1,278 passengers every morning playing a grim game of ‘musical chairs’ for the 738 seats available. All this seems a terrible shame, since rail travel at its best can be one of the divine pleasures of life. As an author who spends much of his life writing about railways, no one loves trains more than me. That eminent railway traveller, Paul Theroux, once wrote: ‘I have seldom heard a train go by and not wished I was on it.’ Would he want to be on this one? I doubt it. The truth is that too much modern train travel has become like the 07.32 from Woking, where we travel trapped in overpriced, garish, harshly lit, cacophonous, beeping plastic trains with silly names, squashed by a miserable mass of humanity. Our carriage sways and lurches – not helped by the fact that the line is basically unchanged since Victorian times, with an antiquated ‘third rail’ power system – whereby the train is powered by an electric track underneath as opposed to the more modern and efficient overhead electricity cables. They were introduced in the 1920s by the old Southern Railway and are now considered obsolete, yet no one has had the courage or resources to rip them out and start again. They make the trains unbearably slow and jolty, to add to the discomfort of overcrowding. Small consolation it may be, but tens of thousands of others suffer conditions just as dire in this daily scramble to work. A miserable one in five of the 545,000 passengers travelling into London on any morning has to stand, with trains serving Paddington, Euston and Victoria worst off. The chief of Britain’s biggest rail firm, the Govia thameslin, Railway mega-franchise, risked the wrath of passengers last week by saying he intended to tackle the problem of overcrowding on trains by making it easier to stand. On some lines, this has already been done: on the Paddington to Reading line, normal seating has been ripped out of Inter-City trains and narrow airline-style seats shoe-horned in, forcing long-distance passengers to travel in conditions that might make Ryanair seem commodious. In the north, where many passengers have to stand for more than 20 minutes at peak times around Sheffield, Manchester, Leeds and Liverpool, the trains are often even worse – with elderly carriages made of bus parts, running on four harsh-riding wheels in a style of the vehicles pulled by Stephenson’s Rocket. Commuting wasn’t always as bad as this. Until the 1980s many commuter trains around the south of England had a buffet car, where you might treat yourself to a noggin or two to ease the pain on the way back from the office – and join your mates in the card schools which were features of such trains. Brighton line commuters could relax in armchairs in art-deco luxury on the Brighton Belle, breakfasting on freshly grilled kippers and – if feeling especially louche – order a cheering Bucks Fizz. Meanwhile, Edwardian era commuters on the Metropolitan Line into Baker Street could reserve seat in a Pullman car, where waiters in crisp uniforms would serve a full English breakfast on the journey, amid the elegant mahogany marquetry, green damask blinds and thick piled carpet. No chance of this today, where not a single train south of the Thames any longer has a buffet car, and on my 07.32, even if one of the elusive snack trolleys could be squeezed aboard, it would in all likelihood be crushed out of shape by the sheer mass of humanity. No wonder, by the time we get to Waterloo, Britain’s busiest station, I’m limp and dizzy. All karma evaporated I allow myself to be swept lemming-like towards the ticket barrier by the sheer mass of humanity disgorged from the train. In a mere 47-minute journey, I’ve morphed into “Mr Angry Commuter” of Woking and looking for someone to blame. In the old days I might have marched up to the stationmaster’s office and had a stiff word with him. But in the fragmented and Kafkaesque world of Britain’s railway system today, no one takes full responsibility any more. Ministers blame the train companies and the train firms blame Department for Transport bureaucrats. It is a bizarre truth, in this Alice in Wonderland management structure, that although the railways are privatised, no new trains can be built without the say-so of the government. In the meantime, on the ground things get worse. It’s a miserable fact that since privatisation 20 years ago, only around 6,000 new carriages have been built, and more than half our trains date from the old days of British Railways. To keep up, industry experts say we should increase this number eightfold., buut the main problem is the ancient infrastructure, built on the Woking line by the old London and South Western Railway in 1840. ‘Our railway is full, and even if we had more trains we couldn’t run them,’ Tim Shoveller, boss of South West Trains, tells me. ‘Waterloo is at absolute capacity in the morning and evening peak.’ State-of-the art infrastructure would cost a fortune – and the Treasury is unlikely to stump up any time soon soon. At the same time, ever more people are using the railways – with the current 1.6bn annual passenger journeys, the highest in history, and rising. But this isn’t because we’re all hooked on the joy of the train. Many are motorists put off by road congestion, or young people who can no longer afford a car. 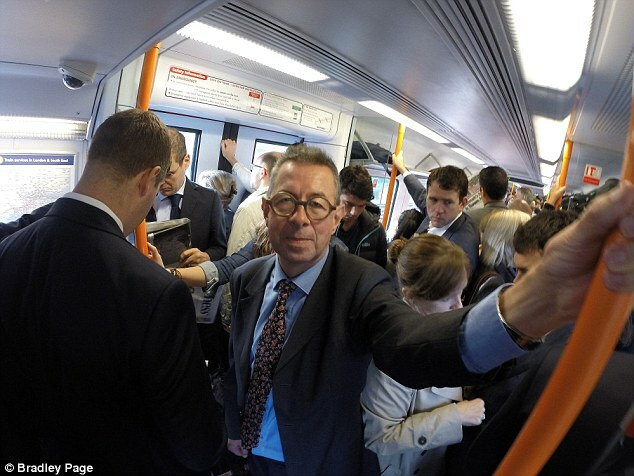 But most are the poor bloody commuters who are piling in ever larger numbers onto the railways – driven into the outer suburbs by sky-high London property prices. The number of commuters travelling into the capital has risen by a third in the past four years alone. Which means that Georgina, Maria and Andy and on the Woking line, and others like them are condemned to the hell of their daily commute, trapped in a ratchet of ever-higher season ticket costs. The season ticket is set to rise by 2.5% in the New Year, hiking yet again the most expensive train fares in Europe. Ministers pledge the rise will fund future rail improvements. But this is scant comfort for many of us who will never see it in our lifetimes. Please Mariko, keep your suggestion to yourself.